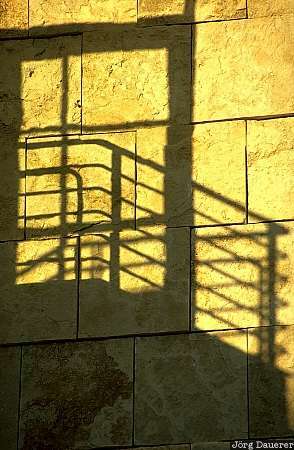 Shadow of a staircase at the walls of the Getty Museum which are illuminated by warm evening light. The Getty Museum is in Los Angeles in southern California on the pacific coast of the United States. This photo was taken in the evening of a sunny day in October 2002. This photo is part of the exhibition Shadows (June 2007).